Regarded as one of the highest progressive jackpot slots, Mega Fortune keeps its promise, and has become one of the most popular games. Over the years it made quite a few players to multi millionaires! The game itself relates to everything connected to luxury. Yachts, jewellery, expensive cars, and watches. This game shows you what you can afford, when you hit the Mega jackpot! There are three different jackpots, all waiting to be won and with some interesting special features, the slot is one of the most entertaining games, where you can win really big! The Mega jackpot is a network jackpot, meaning players from multiple casinos contribute, and the other two jackpots are local to the site, and grow only from contributions of players in the casino where you play the game. What makes the game so special is that everyone has a chance to get rich. You don't need to wager a high amount to be able to win the progressive jackpot, you can even win it with a small wager. However, since this is a progressive game, you can't expect a lot of smaller winnings, the game rather awards less frequent, but larger wins. The theoretical return to player is 96.6%. You can also try your luck to win the jackpot on the go, as Mega Fortune is also available as an optimised touch screen version for mobile iOS and Android devices. 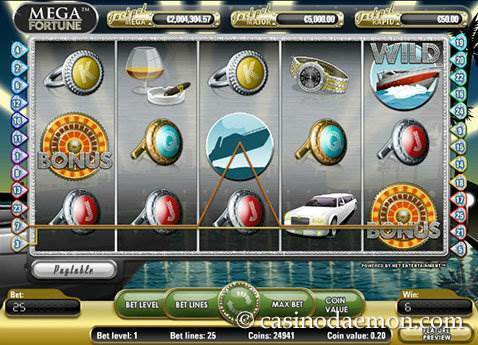 Here you can play Mega Fortune for free and you can take a look yourself what the game has to offer. Although you cannot win the progressive jackpot in the demo version of the game you can see what the hype is about. If you would like to try your luck for real and get your chance to win the progressive jackpot worth millions, you can try the game for real money in one of the casinos listed on this page. 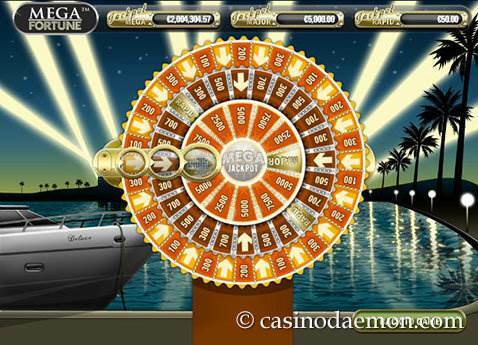 The Mega Fortune slot features a special wild and scatter symbol. The wild replaces other symbols for winning combinations, but not the scatter, or bonus round symbol. If you manage to get five wild symbols on an active pay line you will win 10,000 coins. When you manage to get three scatter symbols anywhere on the reels you can choose one of them and it will be revealed how many free spins you have won, and what multiplier will be used. The multiplier can be between x1 and x5. During the free games you can also win additional free games if you manage to get two additional scatter symbols. In these free games you can win a lot of money, which is in contrast to the fact that this is a progressive jackpot, where you usually wouldn't win that much. The Mega Fortune bonus round is the most interesting feature of this Netent slot game. In this game you can win one of the three progressive jackpots (Mega, Rapid, or Major). 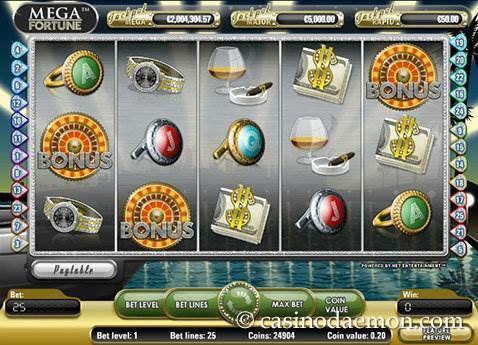 The bonus round is started when you manage to get three or more bonus symbols in succession from left to right on an active payline. You will then see a wheel of Fortune, and have the chance to win one of the three jackpots. The wheel will spin, and when you get a symbol with an arrow you progress to the next wheel when the same happens again. If you are really lucky, and get the arrow on all three wheels, you win the Mega Jackpot. However even if the pointer doesn't land on an arrow, you will win something in any case, and not leave empty-handed. You can play the Mega Fortune jackpot slot in one of the casinos shown on the right hand side. 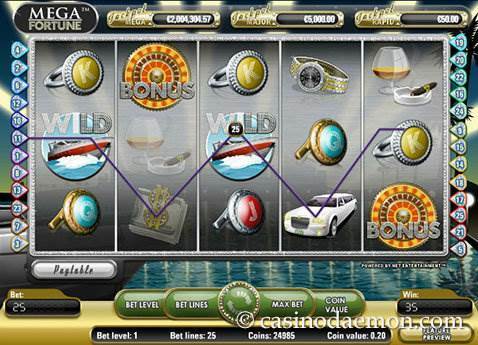 Mega Fortune is a five reel slot with 25 pay lines that can be selected separately. It is recommended to play all lines to maximise chances of winning. You can select a coin value between 0.01 £/€/$ and 0.50 £/€/$ and multiply these by four bet levels. The minimum wager is 0.01 £/€/$ and the maximum 50 £/€/$, depending on the coin value and bet level. The game also features automatic spins.